German soldier shooting a woman with a child in her arms, Ivanograd, 1942. 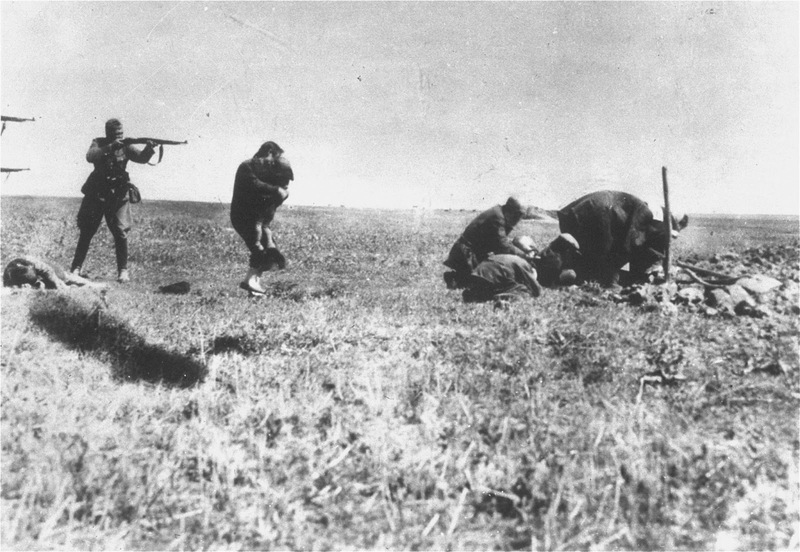 Executions of Kiev Jews by German army mobile killing units (Einsatzgruppen) near Ivanograd, Ukraine. The executioner appears to be standing over the body of an already executed person. The gun barrels of other executioners are visible at the left-hand edge of the photograph. The photo was mailed from the Eastern Front to Germany and intercepted at a Warsaw post office by a member of the Polish resistance collecting documentation on Nazi war crimes. The original print was owned by Tadeusz Mazur and Jerzy Tomaszewski and now resides in Historical Archives in Warsaw. The original German inscription on the back of the photograph reads: “Ukraine 1942, Jewish Action [operation], Ivanograd”. This photo is considered, in the words of British journalist Robert Fisk, “one of the most impressive and persuasive images of the Nazi Holocaust”. It was featured in numerous books, and at photo-exhibits both in Poland and Germany, as “precious and terrible evidence” of “the Nazi cruelties in Eastern Europe”. In 1964, at the height of the Cold War, the popular German weekly Der Spiegel (Nr. 49/1964) published the photograph along with a diatribe naming several angry readers claiming it to be a fake generated by the Russians, although the most incriminating evidence came from the official German records. Confronting a society with photographic evidence of one’s own personal experience of war is almost as old as photography itself, wrote reporter-turned-historian Janina Struk, who discussed this image in her Private Pictures: A Soldiers’ Inside View of War. In extreme situations the “possession of such private pictures could lead to a court-martial”, and yet soldiers keep taking them. Between 1941 and 1945, approximately 3,000,000 Ukrainian and other non-Jewish victims were killed as part of Nazi extermination policies, along with between 850,000 – 900,000 Jews who lived in the territory of modern Ukraine. Original plans of genocide called for the extermination of 65% of the nation’s 23.2 million Ukrainians, and the remained of inhabitants to be treated as slaves. In ten years’ time, the plan effectively called for the extermination, expulsion, Germanization or enslavement of most or all Ukrainians. For me, this photograph has always been one of the most frightening and haunting photographs ever. The poor innocent mother turning her back on her executioner in a vain attempt at protecting her child. The executioner is not even 2m behind her.....what could possess any human to commit such atrocities? this picture is one of the best examples of bad photo-manipulations of that time-periode. Strange thing someone could take it for real.. Yes, the 2 meters distance is dumbshit - made by the propaganda unit which faked it. There are a few good pages in the web dealing with such faked pics, just free Your mind and google them.. I have examined this photo closely and can see no evidence of manipulation. Paddy, I would appreciate if could you please point them out to me. First off, most of the time the Picture is just shown with one soldier and that women running away from him. Often this is already used as evidence, which makes the whole case fishy. Next there is the claim, that these soldiers shoot at enemies in the way distance and the civilians get in cover and are aided by another soldier, while one civilian was already hit. Then the Uniforms of these german soldier don't quite match. Cavalry trousers and forage cap? Is this figure cut together at the Horizont? The photo is fishy and serious galleries don't even show it anymore. Paddy ~ I was good friends with Elroy Heinz, a Canadian soldier who fought in WW2, a strong Christian man, revolted by war in the end. He fought from D-Day all the way through to the collapse of Germany and he told me about two concentration camps that they went through. None of this is manipulated. Elroy was an eyewitness. He had no reason to lie and I knew him well, knew his heart and his Christian testimony. He was salt of the earth and as true as a well-crafted arrow. He saw what he saw and he bore witness to the truth. He saw first-hand what is documented in these photos. He said that even the birds were silent in the camps because the smell of death hung so heavy in the air. He spent much of the war re-crafting one good tank out of two brewed-up tanks and often had to remove the burned remains of soldiers (often good friends) from the tanks before they could start working. Yet he said that the worst thing he ever saw in his life, something he still couldn't forget in his eighties, was what he saw in those concentration camps. Paddy, my friend, your mind is being warped by propagandists. I know an eyewitness. And I have heard camp survivors speak, and seen them recount their experiences while revisiting the camps. They are not lying. All of us can recognize a phony when we see one. These people are speaking the truth. Anecdotal evidence. Thats all you have. Weak mateurish commentary on photographic manipulation is all you have. That and using two aliases Paddy/Andy not blinking an eye. Open your mind. When confronted with ideas that do not align with yours, you bring up stories handed down to you by someone who thought they saw something. Much like an "eyewitness testimony" they are wrong most of the time. Give it a rest please. Good day sir. What if the caption instead had read "Civilians scurry for cover as soldiers take aim at unseen menace"? This is one of the most notorious images of the alleged atrocities on the eastern front, yet its contents do not support the allegations. The woman lifting the child is obviously in motion and on a different level plane than the visible soldier. He is standing farther away and aiming past her, otherwise his rifle would appear more foreshortened if he were turned towards her. The other rifles are leveled at different heights indicating wide spacing between the shooters. If the person shouldering the top rifle were on the same plane as the woman, he would necessarily be 7 feet tall and clearly aiming over her head. The civilian men in front appear to be taking cover in some improvised dugout. The woman in back has already dropped to the ground to avoid fire. That would be a more realistic interpretation of this photograph. I have yet to see the original inscription published anywhere that is supposedly on the back of the original. There is nothing in the picture that indicates these civilians are necessarily Jewish. The Germans were very systematic in their operations and this situation does not look like a credible execution. In all likelihood, we will never know what was going on. This is a perfect example of a photo where timing is everything. Had we seen what was happening moments before/after, this picture would be able to provide better clarity on what theory fits best. And just as you say that there is nothing that indicates they are Jewish, the same could be said for the opposite: there is nothing to indicate that they *aren't* Jewish. It may have also been an actual execution, just one that went awry. But it looks messy, as if it happened on the spur of the moment rather than a methodical execution. Like they tried to escape and the propaganda team spun it into a good angle. Either way, it's a haunting photograph. Deny all that you can, the proof of Genocide is revealed even now. It took me a lil while to get past feeling sick, and take a closer look at this photo. I'm glad I did cuz they're right this photo is totally fake. The soldiers aiming beyond the woman, not at her. It's like they cropped her in a bit too close to the soldier. It looks to me like the ground is more than one photo patched together resulting in weird uneven parts and alternating bright and fuzzy spots with darker and more in focus spots. I know I havent' articulated the problems with this photo very well, so just take your time and look it over. This photo has too many issues to have carried so much weight. What difference does it make whether the picture is "real" or not? Does anyone doubt that this scene and thousands of others--many much, much worse--happened countless times in this and every major war? The integrity of the photograph is hardly the point! "What difference does it make whether the picture is “real” or not?" Seriously? What difference does it make to support a theory, a statement with fake and/or manipulative "evidence"? Even you know the answer..
What the hell is this? How can a man be such heartless and unfeeling. oh God have mercy on this crazy world. There are several versions of this photo, all of them cant be real. This is no german soldier - uniform, rifle, boots etc. they only seems to be "german" on the first view - just compare that. The lighting and the sky are looking inconsistent and the sky looks cut. What is wrong with the shadow on the left side? Reminds me on that picture with the bareboobs hanged red cross red army nurse, wich you can google and see it is constructed. Is there any source for this one here? The germans often ordered the police or military of occupied countries to do the dirtywork, carry out executions and massmurders of civilians because it was not a very pleasant ordeal even if they found it "necessary" and they wanted to spare german troops from the psychological damage. This is a very plausible scene. It does not matter if this particular picture is fake or not..
We all know this happened, and the picture seeks to show the evil wickedness that occurred then. Arguing it was manipulated picture or not holds no water against the story it seeks to tell. Even cinema plays obvious " acting " go on to show this wickedness.. The takeout here is the wickedness the NAZIS perpetuated on the JEWS. and other victims from other countries. may the perpetrators rot in HELL for what they did. I guess all of those pics you see of german soldiers herding boxcars full of Jews to the "selecting" process are fake too. Some were immediately murdered, and some were put into slave labor. Oh yea, some were even used for "medical experimentation". There is nothing manipulated in these pictures or first hand stories. My uncle saw it when his unit liberated a concentration camp in Germany. The wickedness, evil, and shear cruelness of the Nazi regime was not a fabricated tale. Those camps in germany were no extermination camps. People died of starvation and illness. It's a proven fact! There is loads of these famous pictures being proved fake. There's a copy of this photo which shows the much larger scene. This is cropped. They're firing beyond the peasants who are trying to take cover. For those who haven't figured it out yet, Purdy, Andy, etc are sociopathic narcissists. They are totally incapable of any empathy other than for themself. They are masters at lieing, twisting facts, redirecting things, etc., etc. Why do they do this? Simple. It makes them feel superior. This is how they boost their ego. Everywhere they go, everything they say on sites such as this has the same old theme. Also, Purdy and Andy et al totally relate to psychopathic murderer in the picture. Its as though he is their best buddy and friend. Possibly, they even envy him and want to be like him. So, bottom line, don't waste your time trying to reason with such types. It can't be done. This has been proven again and again. To be honest I am not totally convinced that the soldier is aiming at the woman with the child. Still, even if this photo was a deliberate fake, does anyone really want to suggest that, because of one dubious photo, the Olocaust and all other Nazi atrocities never happened? Get real. I am not going to say anything about this particular photo, but the Holocaust Deniers also think the moon landings were fake and Elvis is alive and well at the North Pole. You can't wake up some people. They live in their own world. My father also saw the concentration camps they were horrible places of misery and death. The Einsatzgruppen can trace their orders back to Himmler or Goring through people like Reinhard Heydrich. It is part of the German archives. Yes, there was an attempt to sell German Jews to Britain and the U.S. They turned the Germans down. It is also one of the most shameful acts by the Allies. I do understand though. Even today, they don't make deals with terrorists. There is a point that is crucial to understanding the camps at the end of the war. The POW camps, and concentration camps had very little food. Germany just didn't have it. Even western countries would feed the Army and citizenry before prisoners. The concentration camps were primarily for slave labor at this point. Yes, the Soviets, under Stalin, killed more people than the Germans. Still, the death camps in Poland are one of the greatest testaments to how cruel humans can be to one another. Its very easy to be a 'Holocaust denier' in 2017, in your comfortable house, with a computer, plenty of food and very little fear. Frankly, I'm glad we have such a comfortable life now that we have the luxury of simply denying the Holocaust took place. But people who were there are still alive. They fought for your comfortable house and food. This is typical of the very young and juvenile. Hopefully, when you grow up (as you will be allowed to do, safely), you will start looking at your sources with a bit more rationality. What is the problem with you guys? I was an officer in a nuclear submarine and it often occurred to me that if the came I had to turn the keys with my two other colleagues, that on my own would annihilate more people than the Germans did in WWII. I would be responsible for deaths on an inconceivable scale and it would be quite likely I didn't have too clear an idea of who I was incinerating and later poisoning with radiation etc. etc. I coped by trying hard not to think about it and never discussed it. On the other hand two or three years ago I saw a dog hit by a car and badly hurt and it devastated me. After I left the navy to fight in the Rhodesian War against Mugabe I was an effective killer in the Selous Scouts and do not think it scarred me at all but the majority of those I shot were trying very hard to shoot me. All human beings except for a very few are quite capable of the most horrendous atrocities given certain circumstances. Remember the allies burned to death over half a million civilians in firestorms on German cities in a handful of nights for no military purpose I can relate to. Wasn't it there another photo of the same man wearing the same uniform posing next to some dead bodies with an inscription 'Ivangorod, "killing jews", Ukraine, 1942' written with the same letter?